The passing of a loved one is a difficult time emotionally. While you journey through the grieving process and come to terms with your loss, legal matters associated with the deceased wills and trusts can feel like an insurmountable task. Having to navigate through this type of admin during an important, life-changing time in your family, especially if you aren’t familiar with the associated Florida laws, you may not be able to make the necessary decision in protecting your loved one’s estate. We here at Gary I. Handin, P.A. understand that and want to ensure that you are well prepared should you find yourself in this position. After death, the power of attorney is no longer valid and this person no longer has the ability to act on behalf of the deceased. A personal representative, executor or perhaps a successor Trustee are the only persons that can represent the estate and make decisions on behalf of the deceased. The deceased’s assets need to be located. During this initial period, assets need to be protected and should not be distributed to beneficiaries until all assets have been finalized and accounted for. The assets will become a part of the estate and thereafter will distributed as per the final wishes of the deceased. Distributing assets prematurely can create unnecessary chaos and it can be extremely difficult to locate assets after they have been taken. These assets include personal property, real property and stock and bond certificates. 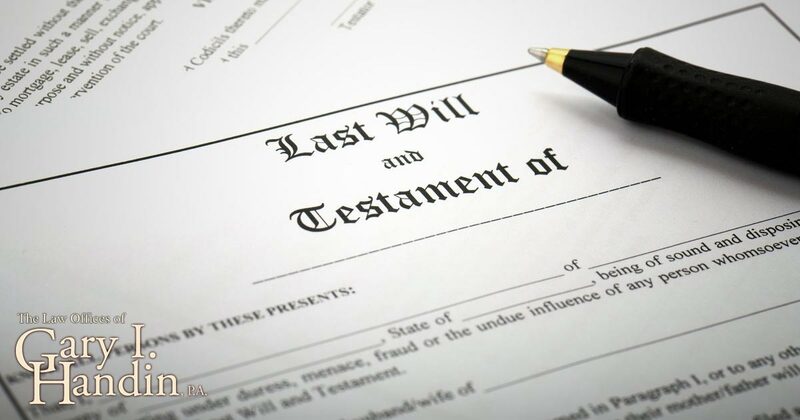 An original copy of a will needs to be identified if family and friends do not already have the will in their possession or know its location. The deceased’s attorney or accountant may have this information. The bank that was used by the deceased may also have this information storing a will in their safety deposit box is common. A will provides the guidance you need when distributing the assets of the deceased and allows the family to honor the wishes and direction of their loved one. A wills and trusts lawyer will be able to guide you through the will when you do locate the will. Debts and taxes become part of the estate and do not become the responsibility of the family and friends. The beneficiaries of the will are also not responsible for these amounts. Creditors are required to follow strict probate rules when validating their claims. They get paid from the assets of the estate. You’ll want to give your loved one the best send-off possible. This is very normal and you should feel free to do so. Although you might feel obligated to pay for this from your pocket, you do not need to. Certain funeral expenses can be reimbursed by the estate. Funeral expenses get before other creditors are covered. Identity theft is rife and even more so when it comes to the deceased. Open communication paths with the executor of the estate. Should any transactions or claims take place on the name of the deceased, they will be the first to know. If the deceased set up a living trust, they would have appointed a successor trustee. Setting up a living trust will prevent the need for a probate proceeding. A trust protects assets from becoming part of the intestate estate. Testamentary trusts are included in the will and become relevant once the trustee has passed away. After a passing, it is best to let the relevant credit card companies, government institutions, cell phone carriers, utilities and other necessary companies know. This is in order to avoid any further charges on the accounts. After the funeral, the death certificate will be issued. Funeral homes will assist you in obtaining these. Getting multiple copies of the death certificate will ensure that you have copies for administrative purposes, however should you run out, the Department of Vital Records can assist you. There are two types of death certificates namely a Long Form and a Short Form. The Long Form certificate will contain the cause of death while the Short Form does not contain the cause of death. The Short Form certificate will be required for each county in which the deceased owned property as well as a copy for the probate administration. If the deceased owns real estate property, an estate will need to opened in order to have the proper transferred. It’s important to remember that creditors can open an estate too. In this case, the court will most likely not appoint a personal representative and rather appoint an independent third party to act as the executor. The executor gathers the assets of the deceased, covers all debts, taxes and other costs. At Gary I. Handin, we pride ourselves in offering the best kind of legal support during this difficult time for you and your family. We believe that through estate planning and open communication, the administrative tasks of a loved one passing away does not need to cause more stress and strife but rather honor the deceased and their estate in the most respectful way possible. Providing professional legal services for the city of Coral Springs. Contact us today for a free consultation – 954-796-9600.